Many years ago, I saw a dance on a New Zealand warship that was visiting Toronto. It was powerful. Big, macho sailors shouted and stamped barefoot in Polynesian grass skirts. They stuck out their tongues and rolled their eyes. I never forgot it. Earlier this month, I had an opportunity to visit New Zealand. On my first day, in Auckland, I went to the Auckland Museum. A huge room was filled with war canoes and Pacific-crossing double-hulled canoes with sails. 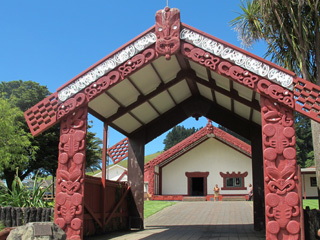 I saw my first marae, the ornately-carved sacred meeting hall, the home of Maori ancestors. Every Maori community has at least one. Maori people performed the same brawny dances I saw in Toronto. I discovered that it wasn’t just a war dance. It was a show of strength, a posturing to elicit the intent of visitors, and a self-introduction that included the names of one’s ancestors. I haven’t found any New Zealand Maori dancers in Toronto yet. If you know of any, please tell me. Maori culture pervades New Zealand. During the next week, I found many examples of it. Te Raukura is a newly opened convention centre on the waterfront near Wellington City Hall. It is home to two impressive war canoes as well as a huge meeting room decorated like a marae. The centre is located where a Maori village stood until the 1880s. 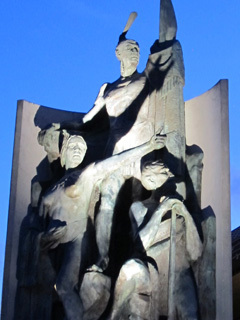 A statue of three Maoris is outside. We found a totem pole near the top of Mt. Eden. 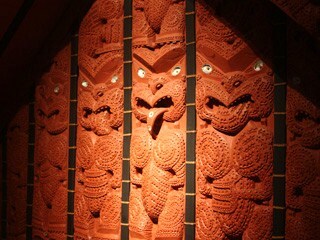 Later, we explored the impressive national museum, rich with more Maori artifacts. These opportunities to experience the culture were all free of charge. Entrance to the museums was free! Even the Maori dancers were free. We didn’t have to pay to watch. I started to wonder about Toronto’s First Nations. What do we have here that highlights our First Nations roots? What can we easily see and show our visitors? I went to New Zealand to attend a writers’ convention. Afterwards, I went on a Maori-themed tour. I am certain that you could get some of the same experiences that we did, without paying. Just look for some Maoris and ask questions. They are very friendly people, proud of their culture. They just might invite you into their homes. The problem is trying to figure out who is Maori. Maori people told us that anyone with even one ounce of Maori blood is a Maori. Some of the Maori people we met in villages said their blood-lines were more Irish than Maori, but they were Maori. 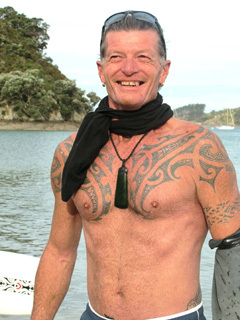 Tony Crewther looked like he was just off the boat from England until he took off his shirt to reveal traditional Maori tattoos. Gary Parata was easier to identify. We first spotted him on the public ferry from Auckland to Waiheke Island. 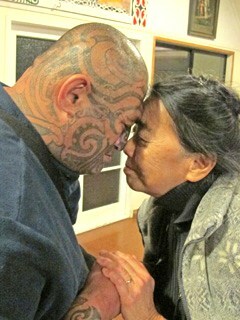 He was the only person we saw with his face and head tattooed in the old Maori style. He looked like one of the chiefs in the portraits in the museums. Gary is a teacher of Maori culture in 16 schools. He was happy to talk about his tattoos. Inspired by a dream, he had them done when he was 44 years old. He wanted to show pride in being Maori. The tattoos represent his ancestors. Maoris, and all of the New Zealanders we talked to, were eager to answer questions about their country. Some of the Maoris said they couldn’t resent the European invaders because they themselves were partly Europeans. There is also no such thing as a status Maori. There aren’t any reserves. We visited three Maori villages. We felt the culture deeply when we arrived at each of their functioning marae. You might try such a visit on your own, though I must admit it is better to hire a guide the first time you do it. When our tour group visited Maori communities, we had to carefully follow the proper formal protocol. We waited at the gate for the owners to invite us in. We had to explain who we were and what we wanted. Then, the Maoris in turn, explained who they were and who were their ancestors. We also exchanged songs and responded to mock challenges from our prospective hosts. Our guide and the Maoris spoke at length in their own beautiful language. Convinced that we were friends who respected their customs, the Maoris then invited us into their homes and into their families. Our noses touched their noses in greeting; we exchanged the breath of life. It was a very moving ritual, fraught with history. Once invited in and fed, the spiritual solemnity ended. Our hosts spoke and joked with us in English. They showed us how they cooked in holes in the ground and in electric deep-fryers. They taught us how to paddle a canoe. (It has to be done with a loud “Hei” with each stroke.} They showed us how to weave with the long leaves of the flax bushes that grow almost everywhere on North Island. The lessons were wonderful. We felt at home and welcomed. We slept one night on the floor of a marae – all 25 of us in one room. Like our First Nations, the Maoris suffered through a period of fighting against the European invaders. The British outlawed their language and culture and took their children away to residential schools. Today, Maoris are accepted as equals. Maori is now the language of instruction in some elementary and high schools. Maori, English, and Sign are the official languages of the country. The Maoris are the majority in some areas. In the whole country, they are about 14%. Maoris feel they are guardians of the land. “We never take more than we need for ourselves,” said one women. “We leave some food behind to regenerate.” Their values reminded me also of our First Nations. Their humour touched us deeply. When one of our host families sang “Now is the hour when we must say good-bye,” I felt tears in my eyes. I remembered this song from my Ontario school days as Maori Farewell. Now I was hearing it in its ancestral home. Somehow I felt that the culture and our new friends would be there if I returned again. And I wanted to return again some day. Hi Francisca, Sorry you couldn’t be there with me. New Zealand was wonderful. Ruth. Usually I really don’t discover write-up about blogs, however would like to declare that this write-up really pushed myself to try and do so! Ones way with words has become amazed me personally. Thank you, very terrific write-up.